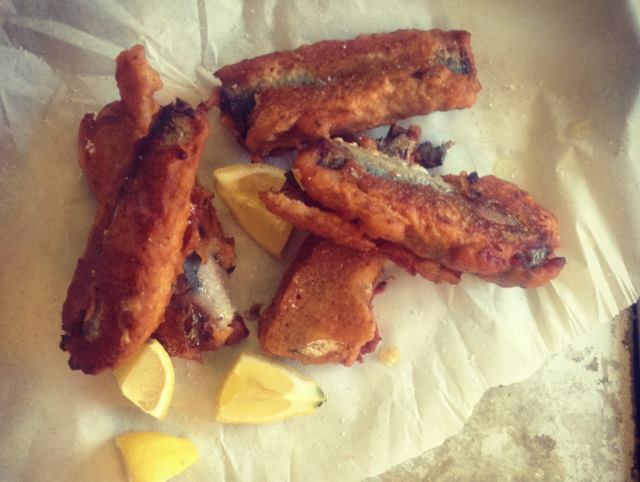 The only way I’ve ever cooked sardines is by grilling them, throwing salt at them and then squeezing liberal amounts of lemon juice over the charred skins. It’s a classic meal that calls for fingers and creates mess. This is a slight alternative, with a Moroccan tinge, but there’ll still be a mess, because the best way to eat anything like this is with your hands. Don’t even bother with a knife and fork, because you’ll only end up tearing the fish apart anyway. Save a little washing up. The trick with this recipe is the secret of the batter. It’s a fifty/fifty mix of plain and semolina flour … this is important, because he semolina flour gives the batter a distinct crunch. It isn’t unusual to add semolina to a bread dough to give the crust the same extra crispness, and it’s often used as the dusting flour for pizza bases for just the same reason. The batter is made with 50g each of plain and semolina flours, two teaspoons of ground cumin, a teaspoon of chilli powder and a generous seasoning of salt and a little pepper. A teaspoon of chilli might sound a lot, but remember that this is only a batter, and the chilli won’t be there in vast quantities on each fish. You should be able to taste the zing of the spices, but they shouldn’t blow your head off. Sardines normally come cleaned and ready to go. If they don’t, gut them using a pair of scissors and rinse under a running tap. Leave the head on, or lop it off – up to you. Five or six sardines per person should be enough. Heat about a centimetre of vegetable oil in a frying pan, dip each sardine into the batter, shake off the excess and shallow fry for a few minutes on each side until the batter is golden and crisp and the fish is cooked through. Serve with a plain salad, lots of bread, some sea salt, and wedges of lemon. Hi, I’ve been a reader of your blog for ages – the Chinese red pork is one of my favourite dishes, really is an inspirational blog. Just recently started my own baking blog, so hopefully you’ll enjoy reading mine as much as I enjoy reading yours.